The history of ore mining in the Ore Mountains on both sides of the Czech-Saxon border has lasted for more than 800 years. 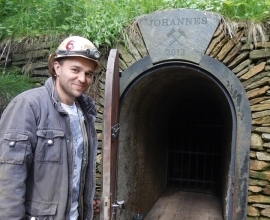 The Johannes adit is located in one of the most remarkable ore areas in the Czech Republic, in the skarn district of Golden Hill, which is a part of a joint Czech-German nomination for inclusion on the World Heritage List. The largest mine in the Golden Hill - Kaff district was the Johannes Adit. This is an exceptionally well-preserved complex of historical mines where the old miners dug enormous underground chambers, which are rarely seen elsewhere in the world. The Johannes Adit invites you to its underground. In this historical mine you shall walk through the 500-year-old history in 2 hours.